Hi! I am back with a video sharing a fun way to layer intricate die cuts for lots of dimension. I am also part of a blog hop with giveaways! I enjoy die cutting as much as I do stamping. Especially when I get to play with gorgeous, intricate dies like the ones I use today! These techniques are such fun and give lovely dimension. For my first example, I layered up 3 green layers of leaves from the Simon Says Stamp Corbel Wreath Die. Be sure to watch the video for a trick on how to do this easily! This die is stunning. In between the leaves, I added a rainbow of Lucy’s Cards Rainbow Jewels. The Simon Says Stamp Script Thanks Die Cut sentiment is covered with Wink of Stella Clear Shimmer and Mini Ranger Glossy Accents. And check out that dimension! The added white dots to the wreath with my Tonic Morning Dew Nuvo Drops. The Simon Says Stamp Foral Burst Collage Die also works great with this layered die cut technique. I layered each of the flowers on this next card… but varied how many layers on each. The pink flower has 3 layers, the orange has 4, the yellow has 1, the green has 3, and the blue has 5. I colored the layered die cuts once again with Wink of Stella Clear Shimmer and Mini Ranger Glossy Accents. I also added a cluster of Lucy’s Cards Rainbow Jewels to the centers. Isn’t that Simon Says Stamp Thanks Script Die Cut classic? Love! I am so glad it comes with the word itself and it’s shadow. For my last example, I used the Simon Says Stamp Heart Sprinkle Trail Die as a template for layered die cuts and lots of Lucy’s Cards Rainbow Jewels. This is SUCH fun in real life… I wish I could capture it in my photos! And by the way, i used a matching Simon Says Stamp Metallic Envelope stamped with a Simon Says Stamp Envelope Greeting for each of my cards. Today’s post is also part of a fun blog hop celebrating Simon Say Stamp’s new “One of a Kind” product release. You can see the whole release HERE. If you missed my Product Release Close-Up Video yesterday, be sure to check it out HERE. The next stop on the hop is the blog of my sweet friend Kristina Werner. You can always start at the beginning of the hop over at the SSS blog. Absolutely login the heart sprinkles. Oh, no, I think I’m too late! :(( Nevertheless, I love watching your fun and inspirational ideas everyday. Never a dull moment. 🙂 I haven’t been able to try diecutting, but it looks like fun so I guess I’ll have to say stamping is my favorite–today! Once again, you are a rock star of card making! Thanks for the inspiration. You simply never cease to amaze me. Each and everyone of these cards is beautiful! I love how you stacked the die cut pieces and they stood out from the entire card. Brilliant idea on each and every card. Thank you for all the absolutely stunning and brilliant ideas that you pass on to our community. One of your great admirers! Oh my goodness! I will definitely be popping up some die cuts now. Thank you. I absolutely love this idea!! The cards are amazing. Thanks so much for sharing!! Love both die cutting and stamping, and can’t wait to try this technique!!! Great ideas! Have to say that I love stamping–must be the little girl in me who likes to colour. My favorite kind of card. Very clean looking but with a punch of color! I think I like die cutting more than stamping! BEAUTIFUL cards. Gives me lots of ideas to use with my existing dies. I just LOVE the flower card!! Yes to die cutting – requires a different type of creativity I think. The texture from die cuts can be fab! Love the 3-D effect and glossy accents, it really makes them pop. Thanks for sharing your wonderful ideas. I don’t even have a diecutting machine! But if I had, I’d love it a lot))) the things you did for these cards are amazing!! Yes I love die cuts! I had just learned about paoercrafting a little while before the original Quickutz handle and dies came out. When I received it as a gift I was like the happiest woman alive! I couldn’t craft without my inks, dies and stamps. Now there are stamps with mathching die sets I feel my dreams have really come true! I find stamping harder than die cutting–I’m not as good as stamping. However, my stamping looks a lot better now that I”m using a Misti! 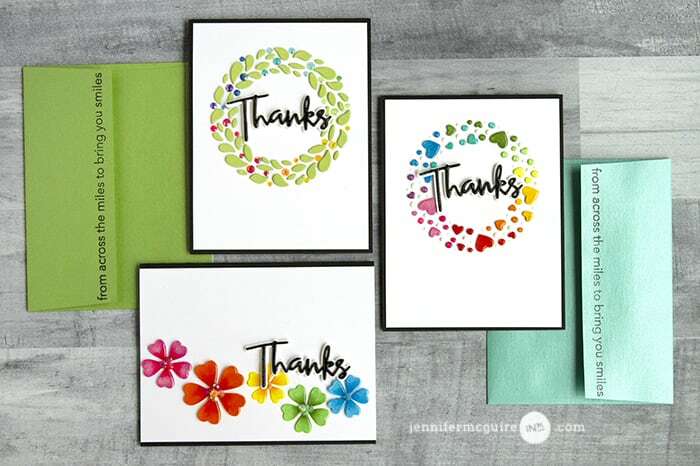 Thanks for sharing some really great card techniques today, Jennifer. As always, you cards are AMAZING!!! Love the dies and it amazes me your creativity and how well you put it on paper. Awesomeness!!! Love your work. Your great at what you do. Thank you for sharing. I just love using my cutting machine! These die cut cards are just amazing! Now I have a new project to try. 🙂 I love the layered look and the depth it gives. Thanks for sharing these with us, Jennifer! You make great cards. Love the dies. Thanks for all of your great tips and videos! I always learn something. I do love die cutting just as much as stamping and coloring!